CricketTalk - India v England: Can Alistair Cook lead his team to a repeat of 2012’s triumph? BANGLADESH may not have gone according to plan for England, but they head to India for a daunting five-Test series confident they can rebound in positive fashion. Four years ago, captain Alistair Cook led England to a memorable 2-1 triumph in India but, this time around they come up magainst hosts who are ranked No 1 in the world and fresh from convincingly beating New Zealand 3-0 on home soil. England captain Alastair Cook Picture: Tim Goode/PA. To listen to our latest show, click on the link at the top of this page. 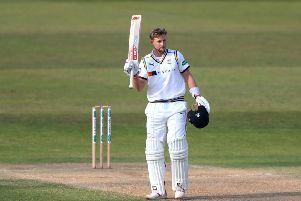 Yorkshire’s Joe Root, Jonny Bairstow, Gary Ballance and Adil Rashid are all part of the touring party and, as the first test gets underway in Rajkot on Wednesday, The YP’s cricket correspondent Chris Waters joins CricketTalk host Phil Harrison to discuss England’s chances.